NEWTOWN, Conn. — The Sandy Hook Promise, a Newtown-based group working to prevent gun violence, has produced a new video — with a chilling twist. The video tells the story of a crush involving a student named "Evan," but it makes a far more important point about school violence. The video has been viewed nearly 6.5 million times on YouTube since it was released Dec. 2. First watch the video above. After the 1 minute and 30 seconds of Evan, the video takes a chilling turn. It shows that "while you were watching Evan, another student was showing signs of planning a shooting." The the last 30 seconds shows the "tells" and warning signs in the background of the story of "Evan." The goal of the video is to show, “Gun violence is preventable when you know the signs,” according to the Sandy Hook Promise group. The Sandy Hook Promise works to prevent gun-related deaths due to crime, suicide and accidental discharge so that no other parent experiences the senseless, horrific loss of their child. It was formed by Sandy Hook parents and others after the Dec. 14, 2012, shootings at Sandy Hook Elementary School left six educators and 20 first-graders dead. The fourth anniversary of the shooting is this week. One goal of the Sandy Hook Promise is to "know the signs" of gun violence. "People who are at-risk of hurting themselves or others often show signs and signals before an act of violence takes place," the group says on its website. "When you don’t know what to look for, it can be easy to miss signs, or dismiss them as unimportant, sometimes with tragic consequences." One warning sign on its own does not mean a person is planning an act of violence, the group said. "But when many connected or cumulative signs are observed over a period of time, it could mean that the person is heading down a pathway towards violence or self-harm," the website says. "By knowing the signs, you have the power to intervene and get help for that person. Your actions can save lives." According to Sandy Hook Promise, 80 percent of school shooters told someone of their plans, but often no one intervenes. 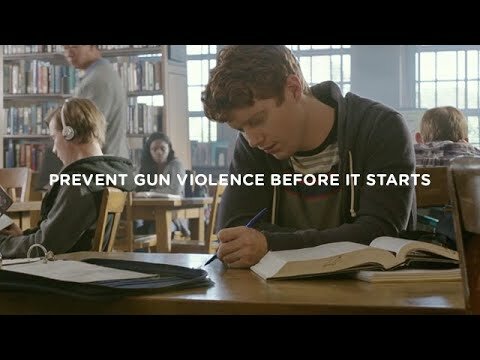 “The PSA demonstrates how easy it is for one to overlook the signs of an at-risk individual demonstrating signs of violence, particularly gun violence, and that when one knows the signs, it can be prevented,” says a statement from Sandy Hook Promise. The video was made by BBDO New York. For more information about the Sandy Hook Promise, click here .